A medical technologist is a professional that gets an opportunity to work in the field of healthcare without having to interact directly with patients. The profession requires analytical skills that are used to properly diagnose conditions. Technologists typically work in labs where they examine samples under a microscope or they take a look at the composition of bodily fluids. If the job sounds like something that you might be interested in, here’s some more information about what medical technologists earn, the factors that affect their income and the career outlook. How Much do Medical Technologists Make in the US? The median annual salary of medical technologists in theUS is 51,940 dollars. The most inexperienced professionals in the field can expect to earn 39,300 dollars per year and the salaries go up to 66,095 dollars per year. In terms of hourly payments, the national median is 24 dollars per hour. The payments can reach up to 30.75 dollars per hour and up to 46.72 dollars per hour for overtime work. The national average medical technologist salary is 51,000 dollars per year. The most experienced medical technologists that are in their late career earn 14 per cent more than the national average. People who are just getting started can expect to earn 11 per cent less. Salaries will also vary by location. The best-paid medical technologists in the country work inBoston and they make 12 per cent more than the national average.New York follows with 10 per cent more,Atlanta – eight per cent and Seattle – six per cent. The lowest salaries are inAustin (eight per cent less than the national average) andSan Antonio (nine per cent less). How Much do Medical Technologists Make in Canada? Medical technologists in Canada earn salaries that are similar to what theirUS counterparts make. The median annual salary in the country is 52,309 Canadian dollars. The best-paid medical technologists can earn up to 77,400 Canadian dollars per year. In terms of hourly payments, the median is 29 dollars. The payments can reach up to 37.30 dollars and up to the impressive 71.46 dollars for overtime work. The national average inCanada is 59,000 dollars per year. Late-career medical technologists earn on the average 22 per cent more. People who are just getting started with the career can expect to earn eight per cent less than the national average. It’s interesting to take a look at the manner in which medical technologist salaries have changed through the years. There’s been a steady and noticeable increase since 2004. In 2004, the median annual salary of medical technologists in theUS was 46,600 dollars. In 2006, the figure has moved up to 50,550 dollars per year. Since 2004, the increase in medical technologist salaries across the country has been over 21 per cent. Medical technologists also have their salaries affected by the industry in which they’re employed. The medical technologists employed in the field of public administration and scientific research have the highest annual salaries of over 57,600 dollars. Health care and social assistance medical technologists earn slightly less – 56,730 dollars per year. The ones that are employed in the field of administrative support happen to be the professionals that earn the least. Mass retirements and chronic medical conditions are making medical technologists more and more burdened every single day. Because of the increasing demand for laboratory testing, there will be numerous additional workplaces available for younger experts that have the right training and qualifications. 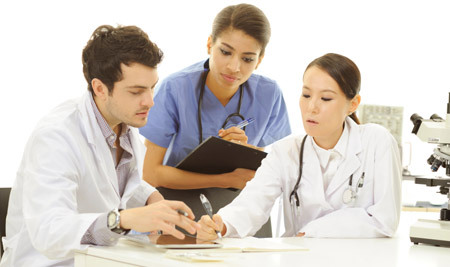 According to the Bureau of Labour Statistics (BLS), there were 325,800 medical technologists working in theUS in 2012. The demand for those professionals will increase by 22 per cent until 2022, which is much faster than the national average for all professions. The percentage translates to 70,600 new workplaces. InCanada, the situation is quite similar. The Canadian Society for Medical Laboratory Science (CSML) reports that 20 per cent of the medical technologists working in the country right now are approaching the retirement age. The unemployment for such professionals currently stands at less than one per cent and the demand for trained medical technologists is expected to continue growing in the years to come.